Sunny Delight is a drink that purports to have an orange taste. Except that it doesn't. Newer varieties don't even make the original claim. Sunny Delight was originally named Sunny D but the manufacturers changed its name to avoid confusion with its inventor, Sunny Delvecchio, or with any of his bodily fluids. Sunny Delvecchio's reaction at the incomparable taste of his new invention, before he added orange food coloring. Sunny D was first put into production by Florida gazillionaire Mr. Sunny Delvecchio. He invented Sunny D whilst attempting to invent a new brand of rocket fuel. As always, Delvecchio brewed the beverage naked, which he thought would help him think more clearly. Uncannily, many cases of the beverage at retail are also consumed naked. 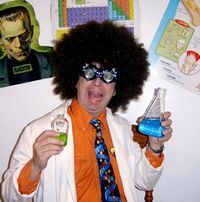 Delvecchio left the lab briefly, heeding the call to a different yellow-orange liquid, and returned to see his son, Sunny Jr., drinking from the beaker. The beverage cured the boy's chronic autism and the first words out of his mouth were, "You know, Dad, this would taste better with some orange juice in there." Over a billion bottles of the drink have been bought, and to date, only five or six hundred people have died from arsenic poisoning. The son of the inventor, and heir to the Sunny D fortune, Sunny Delvecchio, Jr. ("Sonny"), is often seen in his monogrammed shirt. The instant success of the original formula provided funding to develop additional varieties. Customers for orange-colored sugar water were naturally attracted to mango-colored sugar water, lemonade-colored sugar water, and fruit-punch-colored sugar water. Research branched out in different directions as well. Addition of motor oil resulted in the delightful feel of the Sunny D "Smooth" beverage, and aided digestion. "Tangy Original with Calcium" proved to be a profitable use of mouse carcasses often discovered on the factory floor. Finally, "Reduced Sugar Sunny D" was an audacious experiment in manufacturing sugar water that did not have sugar. The bottlers have embraced a "Save the Planet" campaign in anticipation of a sugar-water product that uses neither sugar nor water, but as yet, have not provided samples. Sunny D is notorious for being promoted on the Internet. In an initial promotion, called Reach for the Sun Bottle Hunt, the bottlers vandalized various independent web sites, and declared winners the web-surfers who located the vandalism. Fortunately for the bottlers, web-surfers (as well as players of FSX and contributors to certain humor wikis) are frequently motivated by their inability to distinguish a .JPG photo of an award, epaulette, or merit badge, from the real thing. But they can distinguish it from a bottle of Sunny D, and most "winners" preferred the fake. For those without comedic tastes, the so-called experts at Wikipedia have an article about Sunny D.
The owners of the brand used Internet riddles to guide web-surfers to the vandalism, and in some cases to induce vandalism by imitation. They also manipulated these young rubes into using beta versions of emerging search engines and conducting denial-of-service attacks. Wikipedia calls the campaign a "pioneering Internet meme." It set the stage for all manner of future Web misconduct. In a follow-on campaign, called Peel 'n Taste, customers were induced to put in their mouths strips of paper that usually had spent several weeks on the floor of the supermarket stockroom. This was useful in lending ambiguity to any resulting cases of poisoning. Sunny D was marketed as a healthy energy drink, but this claim was questioned, as the product is essentially sugar water with a dash of piss. The producers insist that drinking water is healthier than never drinking water, and that sugar (actually, high-fructose corn syrup) is a handy source of ready energy. In the U.K., the product was investigated by the Food Commission, the case being remanded to it by both the Water Commission and the Sugar Commission, Britain having no Urine Commission. Yet. U.S. Speaker of the House John Boehner denies that the British beverage or its orange coloring agent is the reason for his own, signature skin coloration. The politician insists he only drinks home-grown concoctions, such as carrot juice and Jack Daniels. The negative publicity escalated when a British girl turned as orange as Boehner from drinking too much of the product. Presently, Michael Moore announced that he intended to drink three cases of Sunny D every day for a year, and is currently filming a project whose tentative name is I'm Orange and It's Your Fault. This page was last edited on 10 September 2012, at 05:35.